Chest wall infections that appear to involve only the skin and soft tissues may actually represent outward extensions of deeper infection of the ribs, cartilage, sternum, or even the pleural space (empyema necessitatis). Inadequate drainage of superficial infection can lead to inward extension into the pleural space, causing empyema. Subpectoral abscess is caused by suppurative adenitis of the axillary lymph nodes, rib or pleural infection, or posterior extension of a breast abscess — or it may occur as a complication of chest wall surgery (eg, mastectomy, pacemaker placement). Symptoms include systemic sepsis, erythema, induration of the pectoral region, and obliteration of the normal infraclavicular depression. Shoulder movement is painful. Organisms most commonly involved include hemolytic streptococci and Staphylococcus aureus. Treatment involves incisional drainage along the lateral border of the pectoralis major muscle and administration of systemic antibiotics. Subscapular abscess may arise from osteomyelitis of the scapula but most commonly follows thoracic operations such as thoracotomy or thoracoplasty. Winging of the scapula or paravertebral induration of the trapezius muscle is usually present. A pleural communication is suggested if a cough impulse is present or if the size of the mass varies with position or direct pressure. The diagnosis is established by needle aspiration. Open drainage is indicated for pyogenic infections not involving the pleural space. Tubercular lesions should be treated by chemotherapy and needle aspiration, if possible. In the past, osteomyelitis of the ribs was often caused by typhoid fever and tuberculosis. Except in children, hematogenous osteomyelitis is a rare problem today. Thoracotomy incisions may result in osteomyelitis. Infection of the sternum most commonly follows median sternotomy incisions, particularly in diabetics. It presents as a postoperative wound infection or mediastinitis with drainage, fever, leukocytosis, and instability of the sternal closure. Treatment consists of open drainage, resection of the involved sternum, and reconstruction of the defect with pectoralis muscle, serratus muscle, or omental coverage. Recently success has been achieved through use of vacuum-assisted closure systems following debridement. Occasionally, sternal osteomyelitis will be due to tuberculosis. Costal cartilage infections are relatively unresponsive to antibiotic therapy. Once devascularized, perichondral tissue necroses and remains as a foreign body to perpetuate the infection and sinus tract formation. The chest wall infection may be established during the course of septicemia, but the most common cause is direct extension of other surgical infections (eg, wound infection, subphrenic abscess). Surgical division of costal cartilages, as in a thoracoabdominal incision, may predispose to cartilage infection postoperatively if local sepsis develops. A wide variety of organisms have been implicated. Erythema and induration with fluctuance and often spontaneous drainage can occur. The course can be fulminant or may be indolent over months or years, with periodic exacerbations. Associated osteomyelitis of the sternum, ribs, or clavicle may occur. The differential diagnosis of that chest wall infection includes local bone or cartilage tumors, Tietze’s syndrome, chest wall metastasis, eroding aortic aneurysm, and bronchocutaneous fistula. The treatment of choice includes resection of the involved cartilage and adjacent involved bony structures. Recurrence is due to underestimation of the extent of disease and inadequate resection. Chest wall reconstruction may be necessary following trauma, surgical resection, or infectious processes. Recent advances in the use of musculocutaneous flaps, the supportive use of methyl methacrylate and Marlex mesh to produce solidity below these muscular flaps have facilitated repairs. 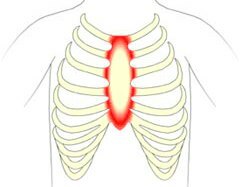 In massive chest wall defects, vascularization of the area is essential and can be accomplished by use of omental flaps as well as pectoralis, latissimus dorsi, and rectus flaps. Microsurgical techniques for repair of such defects have greatly expanded the ability of plastic surgeons to deal with extensive resectional and infective processes.